Turkish Forces Seize Syrian City Of Afrin : The Two-Way The Turkish military has taken control of Afrin, a city in northwestern Syria. An advocacy group says nearly 200,000 people have been displaced by the fighting. Turkey-backed Free Syrian Army soldiers celebrate around a statue of Kawa, a mythology figure in Kurdish culture as they prepare to destroy it in city center of Afrin, northwestern Syria, early Sunday. Turkish forces have seized control of the Syrian city of Afrin. A source in President Recep Tayyip Erdogan's office said in a statement, that as of Sunday morning, the Turkish military and its Free Syrian Army allies have seized control of the city center. The northwestern, Kurdish-majority city has been the target of a two-month Turkish offensive against a Syrian Kurdish militia, known as the People's Defense Units, or YPG, despite calls from Europe and elsewhere for the operation to end. The Turkish assault on Afrin raises tensions with the U.S. Turkey views the Kurdish fighters as terrorists, even though the U.S. has armed and trained some to fight against Islamic State forces in Syria. Reuters reports that Erdogan said, "Units of the Free Syrian Army, which are backed by Turkish armed forces, took control of the center of Afrin this morning." He added that a "large number" of Kurdish fighters had "fled with their tail between their legs," and that de-mining operations in the city are underway. Turkey's offensive against Afrin began on January 20th, and the Associated Press reports it slowly pushed the Kurdish militia and civilians into the town center. The U.K.-based Syrian Observatory for Human Rights says nearly 200,000 people have fled the Afrin region in recent days, and cites witnesses who say intense clashes between Turkish-backed forces and YPG Syrian Kurdish fighters are ongoing. A Kurdish official told the AP YPG fighters have evacuated remaining civilians "because of massacres" by Turkish and allied forces. The Turkish government says the Kurdish forces in Afrin are tied to an insurgent group that has fought for Kurdish autonomy in southeastern Turkey. The AP reports that Turkey "fears the establishment of a Kurdish self-ruled zone in Syria that could inspire its own Kurdish minority to press for greater autonomy." While the Turkish government sees the YPG as a "terrorist army," the militia has been an important ally to the U.S. in the fight against the Islamic State group. According to the BBC's Mark Lowen, "President Erdogan has achieved his twin objectives: to remove a key area under YPG control and to rally the vast majority of Turks behind their commander-in-chief. The jingoism here has been breathtaking. Targeting Turkey's age-old enemy of the Kurdish militants is a rare uniting force in a polarised country." Photos show soldiers in Afrin toppling a statue of Kawa, a Kurdish and Persian mythical hero and symbol of Kurdish new year celebrations that are being held this week. 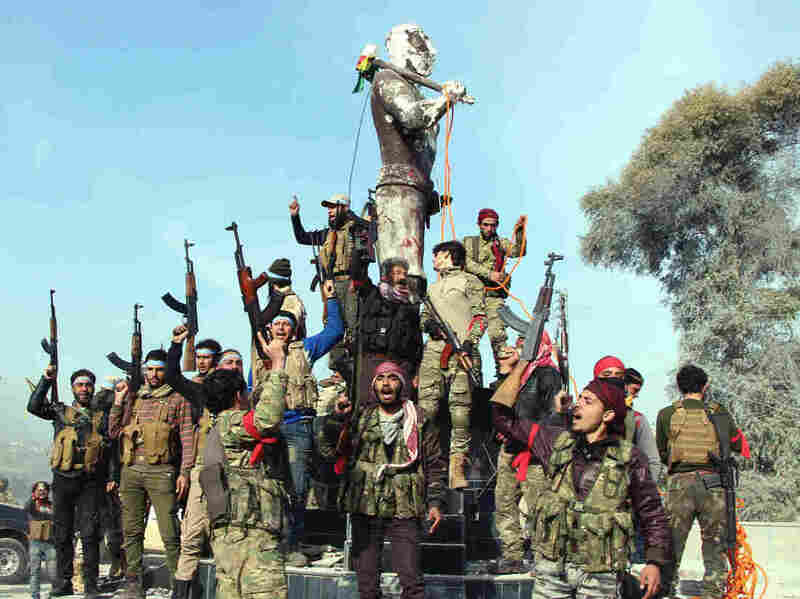 A statement by the Kurdish-dominated Syrian Democratic Forces said the statue's destruction was the "first blatant violation of Kurdish people's culture and history since the takeover of Afrin." The Kurds are the world's largest stateless ethnic group, with a population of approximately 30 million living across Iran, Iraq, Turkey and Syria. "The question now is whether Turkey pushes on to other YPG-held areas, namely Manbij, which could put Turkish troops in direct conflict with US soldiers there who see the YPG as allies. That depends on talks between Ankara and Washington, and the sacking of Secretary of State Rex Tillerson last week removes an important interlocutor for Turkey. "The risk in Afrin is that many residents who will return are Kurdish and could see Turkey as the aggressor. Tearing down a Kurdish statue in the town centre doesn't augur well. Will the Afrin operation actually push more local people into the arms of the YPG?" Turkey's offensive in Afrin is just one of several fronts in the Syrian war; near Damascus, the Syrian Army has seized 70 percent of Eastern Ghouta, and there are reports of civilian casualties. NPR's Peter Kenyon contributed to this report.